Our roving reporters, Diane and Roger Brown, have been exploring again and it makes a nice change to hear someone else's "voice" on Croatia Online. Here's their report on a recent visit to Drvenik Island. Thanks to them for their eloquent prose and today's photo! Early in October Diane and myself decided to take advantage of the glorious autumn weather (t-shirts and shorts) and embarked on the old Jadrolinija Ferry "Losinjanka" from Trogir to Drvenik Veliki. The Ferry edged away from the harbour wall in Trogir and made its way to nearby Seget Donji where it proceeded to load trucks full of building materials bound for for Drvenik Veliki and Mali. Veliki lies approximately five nautical miles south west of Trogir, so it is a short voyage, but, as the old craft glides sedately through the crystal clear waters of the Adriatic you are rewarded with panoramic views from the upper deck. Arriving at Veliki we were reminded by a crew member to be back in time for the return trip - should we have missed the ferry we'd have been stuck until the next day, though there are more frequent sailings in the season. The trucks and passengers disappeared in various directions and we realised we were the only visitors so we explored at our leisure. Off season it is a quiet and sleepy village with several bars and restaurants, and a small shop, that surround the picturesque harbour. There are several fascinating buildings and ruins from a bygone era. We encountered a few local people, who were very friendly, and we were accompanied on part of our walk by a local cat who decided to be our guide and seemed to like our company. We sat and enjoyed a beer overlooking the harbour then visited the local store, where the lady made us enormous sandwiches, which made a very satisfying lunch. 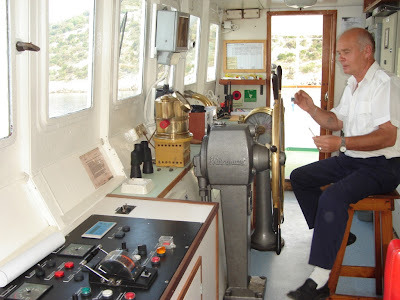 On our return trip I spent most of my time on the Bridge chatting with the helmsman, who, was very friendly and provided a wealth of information. You will see from the pictures that although the vessel has undergone refits it still retains its original telegraph, voice pipes and compass, which are for decoration only. The trip was a thoroughly enjoyable, no hassle experience and I nearly forgot!!! all for the princely sum of 10 kuna per person each way from Trogir. For a current timetable of ferries from Trogir to Drvenik, the easiest way is to contact Atlas Trogir - http://www.atlas-trogir.hr/ or Portal Trogir - http://www.portal-trogir.com/. It's a foot passenger service from Trogir but vehicles can embark, by prior arrangement, at Seget Donji. If you're looking for a self contained apartment, near Trogir and Split, with all mod cons, easy access to the beach, and great hosts if you need them, check out Diane and Roger's website http://www.croatia-apartments.blogspot.com/. Konoba Timun is doing its best to provide winter entertainment on Čiovo Island, near Trogir. Normally all the bars and restaurants close after the busy summer season but Timun is breaking the mould in this area and we wish them every success. A few weeks ago they held an Irish night; this Saturday 24th November is Slavonian night, again with "traditional" food drink and entertainment at reasonable prices. Their website is http://www.konoba-timun.hr/ but unfortunately it doesn't have details of the events. It's definitely happening though, from around 8pm, so if you're in the Split area be there or be square! Perhaps ring Timun on 021 888 106 if you want to confirm timings and prices. Unfortunately we weren't able to attend the Irish night but heard from our friends that an excellent time was had by all - Guinness, good food and then a few informal lessons in Irish dancing from Irish Maiden who's website says they are Croatia's first and only Irish Dance Troupe and we've no reason to doubt that. Based in Zagreb, with a troup led by an Irish man but mostly made up of deft footed Croatians, Irish Maiden runs classes, competitions and performs throughout Croatia. Visit their website http://www.irskistudio.com/ for more information. Thanks to James for today's photo. Apparently he was to busy enjoying himself to take a photo of the guests participating! Not an obvious picture to represent serious studies of a difficult language but obviously these students of the Croatian Language School (CLS) found time to enjoy themselves. The picture was taken at CLS's new summer school in Losinj, a beautiful town on an island in north Croatia, where CLS combines learning the language with finding out about Croatian cuisine. 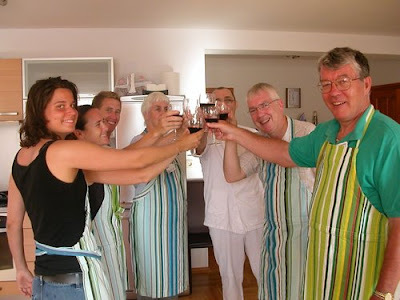 Readers who were interested in our previous posting, on the first vegetarian restaurant in Split, may also be interested to know that CLS's top Croatian cook, Mladen Marušić specialises in vegetarian and macrobiotic cuisine but includes all types of traditional Croatian cooking in his courses at the summer school. You can read more about Mladen on CLS's website - http://www.easycroatian.com/ - in the newsletter section you'll find his recipe of the month; click on one and you'll find a fascinating interview with him on the varied subject of Croatian Cuisine. CLS run a number of immersion courses in Croatia in the summer and have a permanent school in London. The website and newsletters are a mine of information on all things Croatian and you can also download a phrasebook from the site. Every now and then we remember why it takes a lot to beat the Dalmatian way of life. Last Saturday was St Martin's day, when the year's new young wine is christened by "wine bishops". Like most events to do with the land and crops it was a few weeks early this year. As with other produce, the grapes may have been smaller as a result of less rainfall, but they still pack a mighty punch! Dalmatia, on this and other occasions, is about quietly celebrating nature's abundance amongst friends - a far cry from the Beaujolais Nouveau festivities and extravagant private jet flights to bring the first 2007 French wine to whoever can afford the party. Despite the long preamble, and as you can see from the picture, today's posting is not about wine but Dalmatian Olive Oil. We were priviliged to spend St Martin's day picking olives and watching them turned into something really special. Ana, one of Croatia Online's special friends, took us to the village of Marušići, south west of Split and Omiš, where her friends are concentrating on getting the best out of the Dalmatian climate and soil in the most eco friendly and taste bud stimulating way. With 270 olive trees, each yielding 25 kilograms of olives, all handpicked, I'm sure there are days when they might find it a little too much like hard work. At our pace - one tree in about three hours, with some help from an agile tree climber picking the olives off the upper branches - we might not be given a job. However there's little to better having a chat under the autumn sun, in clear blue skies, with a view over Hvar and the Pelješac Penisula, pretending to be working the land. Gentle and very therapeutic manual labour was followed by a brief walk down to the local olive press, kitted out with the best and latest equipment, to watch the olives become the liquid gold that you see above. A little financial help from the EU has been well put to use and each olive grower can see their own olives turned into fresh, pure olive oil, the same day the olives are picked, for a fee of just 150 kunas, regardles of whether they make use of the full 150 kilogram capacity of the press or not. Some years ago olive growers had little choice but to preserve their crop in seawater and make a long journey to the scarce and more old fashioned presses when time permitted and somewhat to the detriment of the end product. Everyone wins from this, particularly the end user who's prepared to source and pay just a little bit more for quality, purity and traceability of the source. We tasted two different fresh oils made from different types of olives and it was like tasting a completely different product - aromas of fruit, no trace of chemicals, and an experience hard to describe by a non professional taster more used to mass produced offerings. Already spoilt, we then had the chance to sample some wine, anchovies, Prošec and Prsut, all home made and cured - a different world even for foodies that take their time looking around the best of London's supermarkets. It takes 7 to 10 kilograms of olives to make one litre of olive oil; that's about three litres per olive tree. Even in Dalmatia, many of the more expensive supermarket extra virgin olive oils (and some on sale in the markets from those lovely but wise Dalmatian grandmothers) may be mixed with inferior quality, mass produced oil. If you can find the real McCoy, be prepared to pay a little extra for it but it's worth it. Look out for the name Orgula when you're next in a Croatian supermarket looking for the best olive oil. They're the entrepreneurs behind the high tech olive press that makes life infinitely easier for Dalmatian small holders in Marušići and allows us to capture the image, tastes and smells of olive picking in the flavours of the oil that is bottled on the same day. Whilst we really enjoy Dalmatian cuisine - generally plain grilled fish or meat - it's always great to have a change. The Dalmatians seem quite conservative in their approach to different cuisines but we think this new Chinese restaurant will go down a storm with ex pats and tourists who are looking for something different. There aren't many restaurants around that cater for a wider variety of cosmopolitan tastes so we were a bit apprehensive when we decided to try out Chinese Restaurant Peking last night with a couple of friends. Our last experience of Chinese food in Croatia was three years ago in Zagreb and that took us back to the days, many years ago in England, when Chinese takeways were a stodgy flavourless gelatinous mess. We needn't have worried however as we had a great meal - subtle and varied flavours, excellent service and a more than comfortable ambience. The restaurant is only a few months old and has yet to fully organise its wine cellar - our only criticism was the lack of a good reasonably priced house wine, normally about 70 kunas (£7) a litre. We're told that's being sourced but in the meantime we paid 140 kunas per 0.75 litre bottle which upped the price considerably. Wine aside, most of the main courses are between 45 and 60 kunas each (£4.50 to £6), fried rice (just enough for 2) is 15 kunas (£1.50) and plain boiled rice (for one) is 5 kunas (50 pence). Though it must be quite difficult to source the right spices and herbs, the flavours were authentic and the overall experience was a thoroughly enjoyable one. The owners are Chinese and our very helpful and efficient waiter was Croatian. You'll find Chinese Restaurant Peking, on the coast road from Trogir to Šibenik. Heading north west past Trogir (without going over the bridge to Trogir Old Town), head towards Seget Donji and about 1 kilometre after Trogir, the restaurant is on your left with good parking. For sailing and cruising news on Croatia, visit our sister site Croatia Cruising Companion where today's posting links to a great article on Cruising Croatia by Sail World.